Austal has successfully rolled out the ‘Express 4’ passenger catamaran ferry for Denmark’s Molslinjen. The vessel’s hull and superstructure have left the construction halls on Monday, before being lifted and joined together to mark the start of the final fit out and the commencement of sea trials. Construction on this next-gen catamaran commenced in April 2017. The vessel features an advanced design with optimised hull form to minimise fuel consumption, as well as Austal’s industry leading Ride Control System for superior sea-keeping and comfort. It can support over 1000 passengers, 425 cars, and will operate at speeds up to 40 knots. 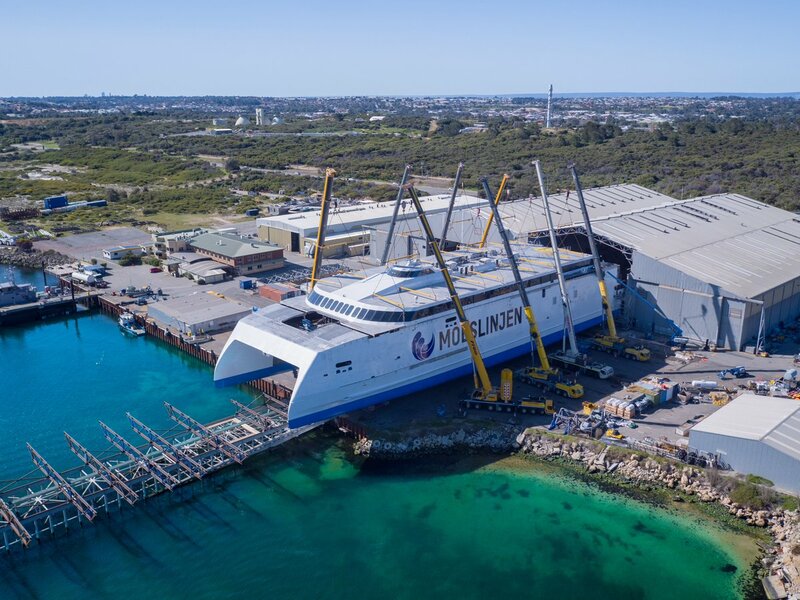 “This revolutionary high speed catamaran is the latest advancement from Austal’s centre of excellence for maritime design. The technology and efficiency of this vessel truly places it in a class of its own” Austal CEO, David Singleton said. The vessel has been designed and built at Austal’s Henderson shipyard in WA, supporting more than 450 jobs.